What’s New: This week at Supercomputing 2018, Intel displays how its industry-leading technologies in the areas of computing, memory and interconnects are defining the future of supercomputing. Intel previewed its next-generation Cascade Lake advanced performance processor, optimized to support the most demanding data workloads, and highlighted the use of Intel® Optane™ DC Persistent Memory in next-generation supercomputers. Intel also announced momentum for the use of Intel Optane DC Persistent Memory in the HPC arena, with the Texas Advanced Computing Center (TACC) being the first supercomputer to adopt the technology in its forthcoming Frontera system. Intel Optane DC Persistent Memory, which will be delivered with the next-generation Intel Xeon Scalable platform (codenamed “Cascade Lake”), is an innovative new technology that increases server memory capacity, accelerates application performance and, unlike DRAM, offers the benefits of data persistence. In supercomputing, where data sets range into multiple petabytes, Intel’s persistent memory offers the potential for nearly “instant boot” of full racks and advanced check-pointing at extreme scale. Based on next-generation Intel Xeon Scalable processors and set to be operational in 2019, TACC’s Frontera is expected to be the fastest supercomputer on a university campus2. Frontera will allow academic researchers to make important discoveries in all fields of science, from astrophysics to zoology. 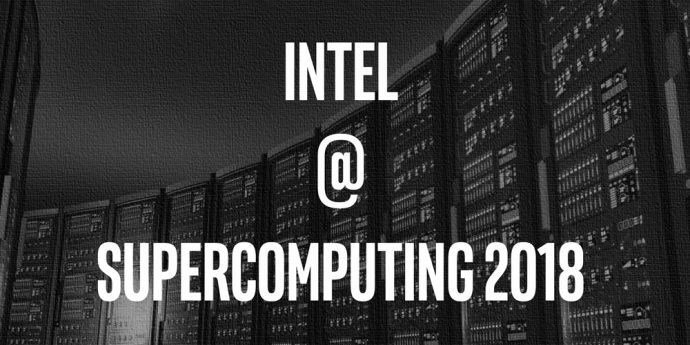 How Intel Shapes Supercomputing’s Future: The industry is moving beyond classical high-performance computing and into a new data-centric era, where HPC becomes intertwined with analytics and AI at a massive scale. Intel’s data-centric portfolio – delivering world-class technologies to move, store and process data – is in high demand to meet customers’ insatiable supercomputing requirements both now and in the future. For the past four years, more than 90 percent of Top500 supercomputing customers have chosen Intel as the foundation for the world’s fastest systems. For information about Intel at SC’18, visit the Intel at SC 2018 page. 1DL Inference: Platform: 2S Intel® Xeon® Platinum 8180 CPU @ 2.50GHz (28 cores), HT disabled, turbo disabled, scaling governor set to “performance” via intel_pstate driver, 384GB DDR4-2666 ECC RAM. CentOS Linux release 7.3.1611 (Core), Linux kernel 3.10.0-514.10.2.el7.x86_64. SSD: Intel® SSD DC S3700 Series (800GB, 2.5in SATA 6Gb/s, 25nm, MLC).Performance measured with: Environment variables: KMP_AFFINITY=’granularity=fine, compact‘, OMP_NUM_THREADS=56, CPU Freq set with cpupower frequency-set -d 2.5G -u 3.8G -g performance. Caffe: (http://github.com/intel/caffe/), revision f96b759f71b2281835f690af267158b82b150b5c. Inference measured with “caffe time –forward_only” command, training measured with “caffe time” command. For “ConvNet” topologies, dummy dataset was used. For other topologies, data was stored on local storage and cached in memory before training. Topology specs from https://github.com/intel/caffe/tree/master/models/intel_optimized_models (ResNet-50),and https://github.com/soumith/convnet-benchmarks/tree/master/caffe/imagenet_winners (ConvNet benchmarks; files were updated to use newer Caffe prototxt format but are functionally equivalent). Intel C++ compiler ver. 17.0.2 20170213, Intel MKL small libraries version 2018.0.20170425. Caffe run with “numactl -l“. Tested by Intel as of July 11th 2017 -. compared to 1-node, 2-socket 48-core Cascade Lake Advanced Performance processor projections by Intel as of 10/7/2018.